Before starting a blog and getting more into the world of beauty, skincare was never something that appealed to me. Now, it is all that I care about, finding new products and bands to test. Before we get into the post, let me give you a bit of history about my skin. It has always been sensitive, oily and prone to breakouts. Up until recently I always used to use products aimed at controlling oil, then at my Dermalogica skin analysis, I found out that I have combination skin. A nice balance between oily and dry, so the products that I should use need to be a mixture and target different things. 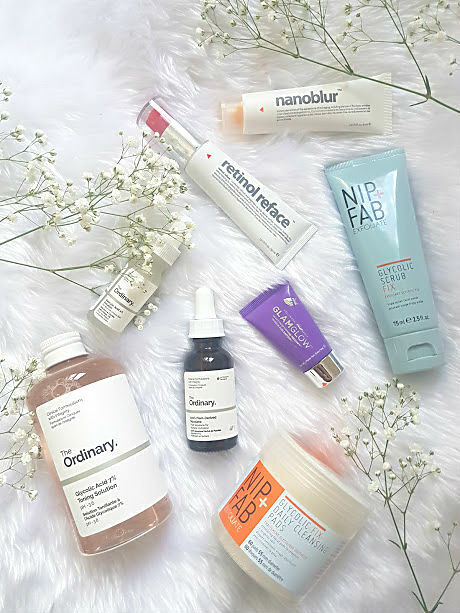 For the past month, I have been trialling a whole lot of new skincare and its time to give the run down and talk about what worked and what didn't. Grab a snack, this is one long and very rambly post. The Glamglow Gravitymud Firming Treatment (full size £39) has been the mask I've currently been trying out. It claims to firm up the skin and tighten the contours, after you apply this mask to the skin it turns silver, very cool but makes you look like an alien! Due to this being a peeling mask, a thick layer is required to allow the peeling to occur properly. My skin looked brighter after using it but nothing felt firmer and my skin was very dry, such a shame because I really wanted to invest in a glam glow mask. 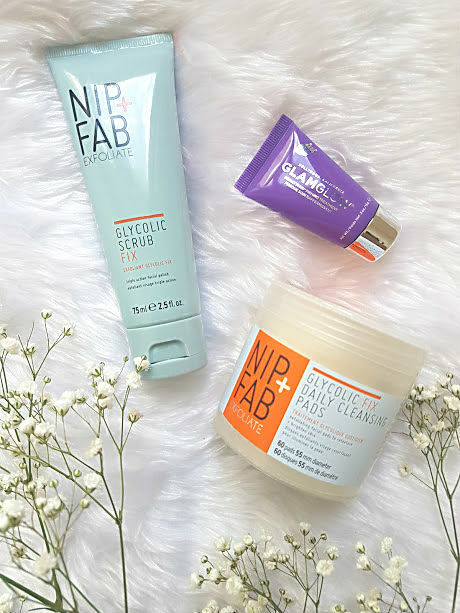 Next up are two incredible products from Nip & Fab's Glycolic range, both of these are just amazing. I've been using the scrub (£9.95) two or three nights a week to give my skin a deep clean. It does exactly this, cleanses my skin, helps with dry skin and afterwards my skin feels refreshed and instantly looks brighter. Alongside the scrub, I have been using the daily cleansing pads (£12.95). I take one of these pads every morning and swipe it around my face before applying any moisturiser. These have given my skin a smooth base before makeup and has helped clear any active breakouts. When a spot pops, these are great to stop the bleeding and help to prevent scarring. Indeed Labs are a brand that I had heard of and seen in my local Boots but never tried. I guess you could say its a brand that doesn't seem to get spoken about very much. Nanoblur* (19.99)is their revolutionary product, it contains millions of tiny particles that makes the skins surface appear almost flawless. As I am only young, fine lines and wrinkles isn't an issue for me but redness and large pores is and Nanoblur helps to reduce both of these. After cleansing my skin, I pat a small amount around my nose area and my skin is transformed. Application with this product is key, no rubbing only patting and not to be used as a primer. Initially, I thought this was a primer to wear under makeup but it is not and does not work, my makeup went all patchy and broke down. This is best worn on its own for those bare face days, as it evens out everything. 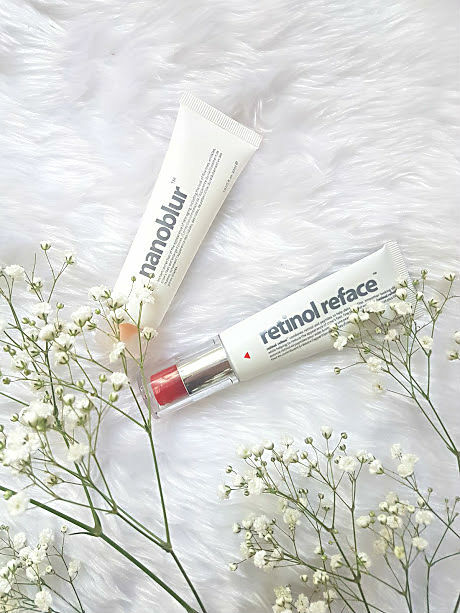 The next product from Indeed is their Retinol Reface* (19.99), I honestly don't even know where to start with this product, using it as part of my night routine consistently has changed my skin. This is retinol, which in the beauty world is deemed as the one of the most effective skincare ingredients to give you smoother looking skin. After cleansing my skin, I have been applying the tiniest amount of this (a little goes a long way) all over my face, leaving it to rest for about twenty minutes and then following up with an oil which is mentioned later. I am not even joking when I say that this cleared my skin of acne scarring, blemishes are appearing less and dullness. It didn't happen over night, it took about a week to see results and three weeks on I am so thankful to this little tube. It is very lightweight, almost serum like and should only be used in the PM due to it being very strong, followed by SPF in the morning. Retinol is something very new to me and how I wish that I had discovered it months ago, because it is life changing. Even though all the products mentioned in this post have helped my skin in some way, this has to be the ONE. If you've made it this far then congratulations and sorry for this post being so long and wordy. 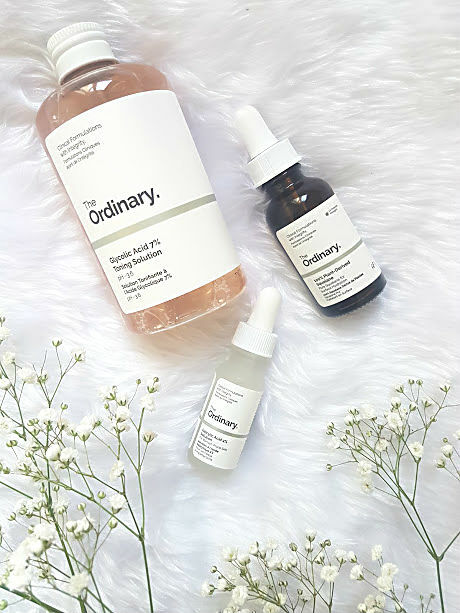 The Ordinary are an all round amazing brand, they've recently launched their foundation range, which I need to get my hands on. I was very kindly sent some products to try out and they have stolen my heart. The oil that is mentioned earlier on is the Plant-Derived Squalane*, which is a hydrocarbon that is naturally found in the skin and is great at keeping the skin hydration and supple. I've loved using this as a moisturiser at night, my skin soaks it up and I wake up the next morning with skin that is as soft as a baby's bum! Then there are two direct acids that have been a great addition to my skincare routine, on nights where I use the retinol, I do not use acids as they don't mix well. The Glycolic Solution is of course Pixi's Glow Tonic Rival, in my opinion this one is better. Not only do you get double the amount of product for half the price, but it works a lot better on my skin. With this I can see a difference straight away, my skin instantly looks brighter and almost as though a layer of skin has come off. For the days that I can feel a spot brewing under the skin, I have been applying the Salicylic Acid directly on it. The smallest amount of this is more than enough, every time I have used this at night, the next morning the spot is practically invisible! No whitehead, redness or inflammation - life saver for when you have an event or important day ahead. All of these products have helped in the journey of clearing up my skin, of course it is isn't completely clear and perfect but I hope that using all of these more and more will clear it up. What skincare products have you been loving at the moment?